In the table all models are mentioned, the years of production and the numbers of production. The Rolls-Royce- and Bentley-models are technically completely the same but are different for some outer distinguishing marks. The cars that are technically the same are mentioned on the same row in the table. Click on the green texts. An overview of the model changes is listed on the page about the chassisnumbers. 1) In the US the Corniche Convertible was sold up to and including 1985, on other markets up to and including 1987. So in the US the Corniche II was sold since 1986, in other countries since 1988. The Bentley Continental Convertible was deliverable from 1985. 2) Sometimes this Corniche is called Corniche II. But that is not correct. The Corniche II was sold since 1986 and only as a Rolls-Royce and as a convertible. 3) The name of the coachbuilder "Mulliner, Park Ward" is abbreviated as MPW. 4) Including 25 special versions of the Rolls-Royce Corniche IV, the "Anniversary Corniche" (1993). 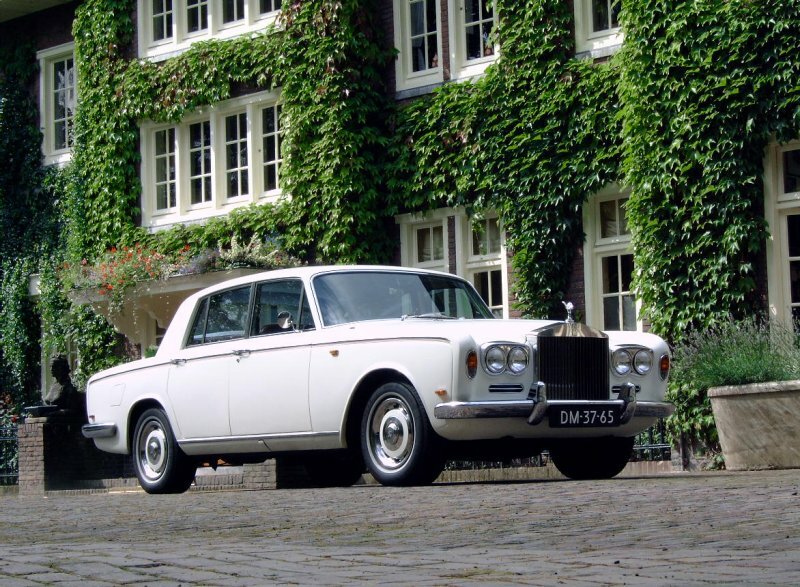 In total 40,991 cars were built based on the Rolls-Royce Silver Shadow. When I use other sources, this number can increase up to 40,997 cars. My Rolls-Royce Silver Shadow, photographed in August 2004.